She looked over her shoulder, just to make sure no one was watching. Satisfied, she turned back towards the hole and flattened herself to the ground. Carefully, she crawled under the fence. She poked her head out onto the other side of the fence, and breathed deeply. The smells of the forest greeted her. They made her almost giddy, as she finally realized how close to freedom she was. She crawled forward when she suddenly felt a sharp pull on her neck. Her collar was caught on the fence. She grunted, and tried again to pull herself forward, harder this time. The collar stopped her again. Desperately, she tried backing up, and then pulling forward again. But her collar jerked her back. She gave a frustrated hiss, and stretched out her forelegs. She scratched the ground with her sharp needle-like claws. For a few minutes, she continued trying to struggle her way out from under the fence, but it was no use. Her collar held fast. Sighing, she laid her head on her paws and prepared to wait. She didn’t know what for, but she knew that she couldn’t get out of this predicament on her own. The hours passed slowly. The sun sank along with Duchess’s hopes of ever reaching freedom. An ant crawled in front of Duchess, its shiny black body illuminated by the setting sun. She batted at it with her paw until it finally crawled out of her reach carrying its leafy burden back to some hidden anthill. Finally, she heard the familiar creak of the hinges on the back porch door. She couldn’t turn her head far enough to see behind her, but she imagined the flood of light that would come pouring out of the door, soaking the dark backyard with its artificial rays. She heard her owner calling, his voice harsh and expectant. She knew he would not be happy with her for staying out so late. Usually, she came inside before it got dark. She mewed, hoping that he would hear her and come to her rescue. But he didn’t. Duchess heard the door shut behind him as he trudged back into the house. Determined not to wait out the night in this awkward position, she again began to struggle. She squirmed and pulled, but the stubborn collar would not release her. Suddenly, she heard a rustle in the bushes in front of her. She stopped, ears pricked and eyes wide. The tips of her paws tingled as she imagined what could have possibly made the noise. She remembered how her mother had said that there were many dangerous creatures living out in the wild. Could it be one of the creatures her mother had warned her about? She sniffed the air. All she could smell was the same old smell of the woods. But then a gentle breeze hit her face, bringing with it a smell that she recognized. It was the same smell she had scented at the hole that afternoon! The scent had faded from the hole, but it now was brought to her stronger than it had been. The fur on the back of her neck stood up. From the bushes, she spotted a pair of bright yellow eyes staring straight at her! But then the eyes started moving towards her. They came closer and closer until they finally emerged from the bushes. Out stepped a young tom. His silver chest shone against his black fur, and there was a brown patch of fur on his broad forehead. They stared at each other for a moment. Duchess was too scared to speak, but the tom meowed, “Need some help?” His voice was gruff, but not unfriendly. The black cat stepped forward, and bent down toward Duchess’s neck. Gently, he grabbed her collar with his sharp teeth. “Now back up,” he instructed through clenched teeth. Duchess obeyed. She backed up, and at first it seemed as if it was simply a waste of time. But she kept pulling, and gradually she felt the collar slipping over her ears until it finally was all the way off. Duchess sat up and looked at her rescuer. He still held the collar in his mouth and was using it to pull the fence upward so that Duchess could wriggle through. “You comin’?” he asked, a bit impatiently, Duchess thought. Duchess squirmed under the fence, and, at last, was on the other side. “Thanks!” she breathed. She was still a bit shocked at this sudden appearance. The young tom shrugged. “It was nothing,” he replied. The two cats sat in awkward silence. Then the silence was broken by a loud rumbling of Duchess’s stomach. Embarrassed, she looked down at her paws, and tried to act natural. Duchess looked up at him, her eyes glittering with defiance. She didn’t want to appear like a little kit to this young stranger. “Not long,” she answered coldly. The tom noticed the defiance in her eyes, and his whiskers twitched with amusement. “Well when was the last time you ate?” he questioned. Duchess shrugged, and looked down at her paws. “This morning,” she mumbled. The young tom nodded, and stood up. He padded off into the bushes. “Follow me,” he called over his shoulder. The black cat nodded, but didn’t give any reply. He kept up a steady pace, and Duchess found it a bit hard to keep up with him since her legs were quite a bit shorter. The tips of her ears only came up to his eye-level. “What’s your name,” she finally asked. Duchess looked up at him, confused, “A what-ice?” she said. “A warrior? What for?” Duchess asked. This whole thing wasn’t making any sense. Silverpaw rolled his eyes and tried to patiently explain. “I can see I’ll have to start at the very beginning,” he said. “Further into this forest, there’s a lake. Around this lake there are four groups of cats: ShadowClan, RiverClan, WindClan, and Thunder Clan. That’s the one I’m in.” He stopped to make sure Duchess had understood everything he said. Duchess was sitting and looking up at him, her clear blue eyes filled with curiosity. The patchy moonlight that came through the tree-tops glimmered on her silvery fur. “Go on,” she prompted. “So each Clan has their own territory and boundaries. 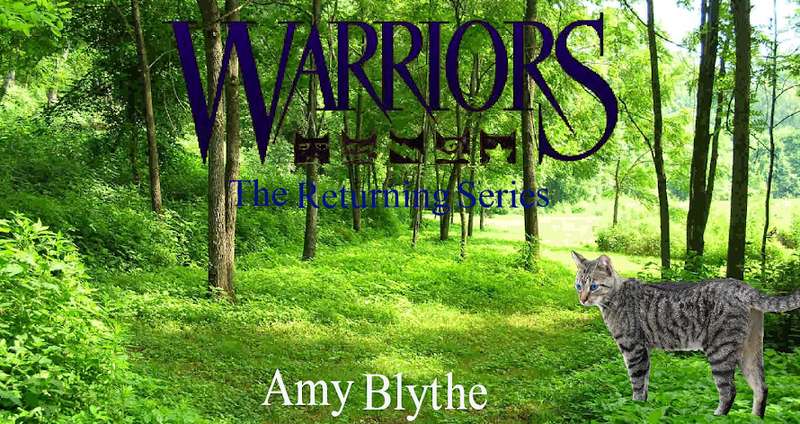 We warriors have to protect our territory from invaders from the other Clans,” he continued. “But I thought you weren’t a warrior yet. You said you were training to be a warrior.” Duchess pointed out. Silverpaw shuffled his paws and huffed, “Well, yes I did say that. But I still help protect my clan,” he defended. Duchess’s stomach growled again. But she looked at Silverpaw, trying to act like nothing had happened. Duchess laughed. She followed Silverpaw as he again began his steady trot through the woods.